MARY m. VOIGT • Department of Anthropology, College of William and Mary, Williamsburg, Virginia 23187-8795. Life in Neolithic Farming Communities: Social Organization, Identity, and Differentiation, edited by Ian Kuijt. Kluwer Academic/Plenum Publishers, Kew York, 2000.
abundance, and fertility"(Mellaart 1967:202).More recently he has described this deity as the "source and mistress of all life, the Creatress, the Great Mother, the symbol oflife itself" (Mellaart et al., 1989:23). More complex constructions of the ideology represented by the material remains from Catal rely on ethnographic comparisons drawn from regions beyond the ancient Mediterranean. Jean-Daniel Forest (1993, 1994) restricts his discussion to the mural art from Catal, including both figural and geometric designs. Relying on a structuralist approach and drawing analogies with (unspecified) African societies that he considers similar to Catal (Forest 1994:118),Forest views the arrangement of wall elements as a metaphor for kinship, with females serving as links between male lineages. A female principle is ubiquitous and ambiguous, beneficent and maleficent, associated with life/birth and death (Forest 1994:123). He states that "the whole set of designs and patterns, either figurative or not, either moulded or painted, may be classified into two categories, respectively referring to a generative principle, conceived as female, and to its product, conceived as male" (Forest 1994:127). The varied dimensions of meaning identified at CatalHoyuk can be seen to be involved most closely in the negotiations between men and women within the domestic context. Women were represented, misrepresented or made invisible in different domains. The ambiguous and contradictory meanings of symbols were involved both in establishing women as life-givers and life-takers. The dependence of society on women is incorporated, transformed, and denied (Hodder 1987:52). 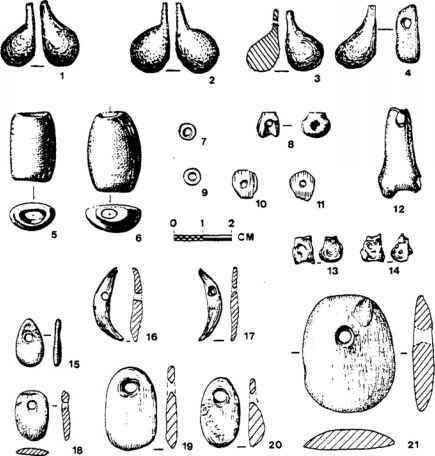 Building upon these previous works, I draw upon ethnographic literature and previous considerations of the Hajji Firuz and Gritille Hoyuk figu rines to discuss how patterned distributional data and consideration of figuring form and breakage aid us in interpreting Near Eastern Neolithic figurine industry in general and Catal Hoyuk in particular. Moreover, the goals of this chapter are to specify some of the internal relationships that are central to Hodder's analysis and to any alternative interpretation of the Catal Hoyuk figurine industry. My initial definition of "context," however, differs from Hodder's. Starting with dirt—the archaeological context in which early Near Eastern figures and figurines occur—I will move to a consideration of the human behavior that might account for the location and condition of figures and figurines at any site—that is, their immediate cultural context. Finally I consider the culture historical context, looking east rather than west and to contemporary and earlier sites rather than the later sites in Europe. Just as Hodder's analysis stems directly from his research among the Nuba and his interest in the spread of agriculture into Europe, my own analysis grew out of my fieldwork at two Neolithic sites located in northwestern Iran and in southeastern Turkey. This chapter begins with a summary of results from Hajji Firuz Tepe and Gritille, each of which contributed to my picture of ritual and religion at early sedentary communities in the Near East. Excavation carried out in 1968 at Hajji Firuz Tepe (northwestern Iran) was designed to recover information on economic and social organization of a sixth millennium farming community. Recovery methods emphasized artifact distributions in an effort to define the economic activities performed by households, providing control over the location of finds relative to architecture, trash deposits, and other features such as hearths and burials. This kind of recording is normal for sites in the Near East excavated over the past couple of decades, but represented an innovation at the time (see, for example, the discussion of provenience problems at Catal Hoyuk in Hamilton 1996). The stratigraphy at Hajji Firuz allowed the definition of relatively small chronological units, estimated as around fifteen years based on an architectural cycle: the construction, use, and decay of mud brick buildings (Voigt 1983:1&30). In order to move from architecture and artifact to action, I relied heavily on ethnographic analogy, where possible supplemented by wear patterns. This approach was used in the analysis of all artifacts recovered, including clay figurines. What follows is a brief summary of the evidence and argument published in 1983.